Let’s just suppose you asked a dozen soon-to-be retirees – “what indulgence would you like to acquire once you leave full-time work? You can be sure you’ll hear twelve answers that are different from the one longtime Scugog Township resident Jerry Taylor would give you. Posed with that question, some people might aspire to swing a new set of golf clubs, join a leisure-time organization, or perhaps even hitch up a recreational vehicle to travel the country. But how many do you think would single out purchasing a bulldozer? That’s just what Jerry Taylor did following his decision to retire from public service and private business a number of years back. It’s understandable – how the simple pleasures of those physical activities might appeal to a man who spent decades extracting compromise from fellow politicians and committee members. And like many retirees, he gravitated to an activity marking “a sharp left turn” from his professional pursuits. But we’re getting ahead of ourselves. Buying and operating a bulldozer marks the “new beginning” of Jerry’s story, but we’ve so far neglected its early and middle parts. Scugog’s second mayor, Jerry Taylor, didn’t at first, aspire to political office. Neither did he set his sights on rural living. In fact, he started his working life well away from both, serving on the Metro Toronto Police Force. Growing up around Malton in of west end Toronto, he attend high school in nearby Brampton. It was while attending high school he met Sandra and after graduating the young couple married. Jerry worked at a variety of jobs until he decided to join the police force when he was 21 years-old, but this career lasted only five years. But by the mid-60’s, the young officer began to yearn for a less stressful lifestyle in a more pastoral setting. Drawing on pleasant childhood memories of summers spent on his grandparents’ dairy farm, Jerry and his wife, Sandra and their four boys relocated to 200 acres on Scugog Island. A herd of about 45 cows made theirs a working farm and at 27 years of age, it made Jerry the youngest dairy farmer on the island. Jerry recalls there were many times at the early stages of his farming career that he sometimes wondered if he had made the right decision. “Working seven days a week was quite an experience, but it was a great enviroment to raise a family since everyone had to chip in and help,” he says. Fate sometimes conspires with opportunity. Jerry’s farming neighbours, perhaps sensing latent ability, nominated him as their representative on the Ontario County Milk Marketing Board. Two years later, they approached him with a further request, this time for the role of councillor, to sit on the former Scugog Island council. In 1974, with politics and farming keeping Jerry busy, Sandra decided to open a clothing store on Water St. called Country Classics. The store sold jeans and fashion for the younger generation. A few years later she expanded with another location on Queen St., catering to a more mature customer. As his interest shifted more to local politics, after 14 years operating the farm, the Taylors sold their cattle and property in 1980. Jerry served seven years as Scugog Island’s representative, before making the decision to seek the township’s top political position. “The next thing I knew, I was running for mayor,” he says with a smile. Jerry would hold this post and lead Scugog Township through multiple terms starting in 1978, defeating the incumbent Mayor Lawrence Malcolm. “It was one of the most exciting and rewarding points of my political career,” he recalled. “After I’d served as mayor for ten years, I decided to retire. I enjoyed it, but politics wasn’t my full-time job and was quite time-consuming,” he admitted. 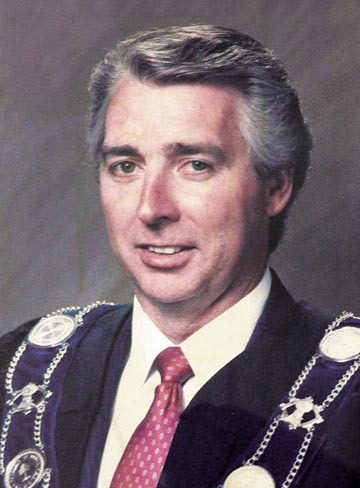 Part of the role, during his time on council and as mayor, included membership on a number of community-service committee. Jerry was drawn to organizations which touched his heart. This was followed by a six years as a member of the the local hospital board, including one as its chair. 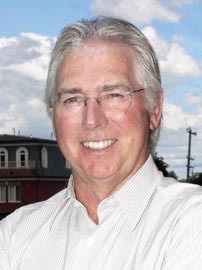 He also served as chairman of a committee which explored, and ultimately oversaw, the amalgamation of Uxbridge Cottage Hospital and Community Memorial Hospital, Port Perry in 1997. Another stone is still unturned in Jerry’s story. Politics, he’d stated, was his part-time concern. Jerry and Sandra also found time to join the local curling club. Political life, he remembers with a wry smile, made being an inconspicuous member at times difficult. Jerry and Sandra have been married 54 years and in that time raised four sons, and now have eight grandchildren, seven boys and girl. Both take an active interest in the busy lives of these active young people, who range in age from 15 to 28. Like most grandparents, he swells with pride talking about their assorted endeavours. When the time was right to leave public and professional life, like many imminent retirees Jerry allowed himself to daydream about what would come next. And how’s that worked out, Jerry? “Construction’s very satisfying work – very ‘therapeutic’ for a retired person. But I’ll admit the novelty’s not as strong when you have to be on site at six o’clock in the morning”.